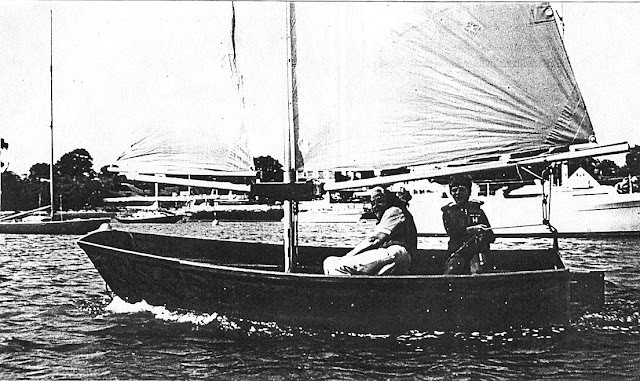 I just wrote that the 12 Foot Skiff was the hardest dinghy to sail in the World... but the Finn, ahh! the Finn. Watching the Olympians race this cranky, old, singlehander, big sail with long boom, in a big breeze, you just can't help to marvel at the skill, the physicality, the training to do this in close to thirty knots of breeze. Swede Max Salminen performing for the back deck cam at the 2018 Finn Europeans. 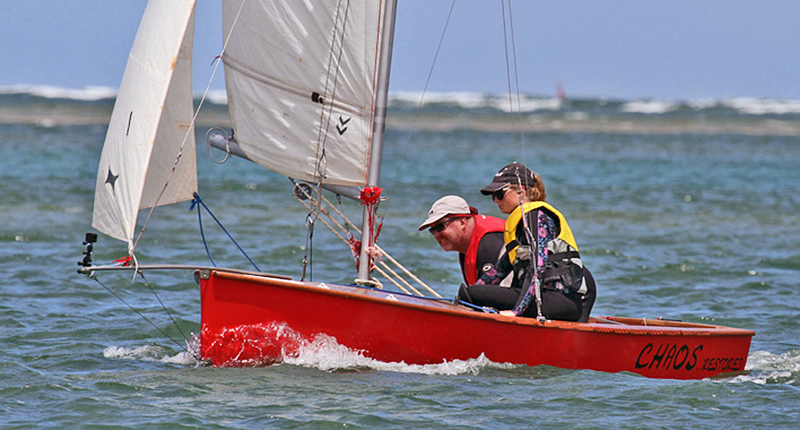 I've read that the Antipodean 12 Foot Skiff is the hardest dinghy to sail. I won't doubt it. A short dinghy is always twitchy; two wiring is always tricky; no limit on the sail area just ups the ante. Here is a short drone video of a 12 Foot Skiff jib-reaching back and forth. Even without the assymetric spinnaker up, you get a good feel for how on the edge this dinghy is, how much skill she requires from the crew, as she blasts along. My favorite is the F-bomb post. You can find other Cherub posts here. "This was the day the hard weather enthusiasts had been waiting for. 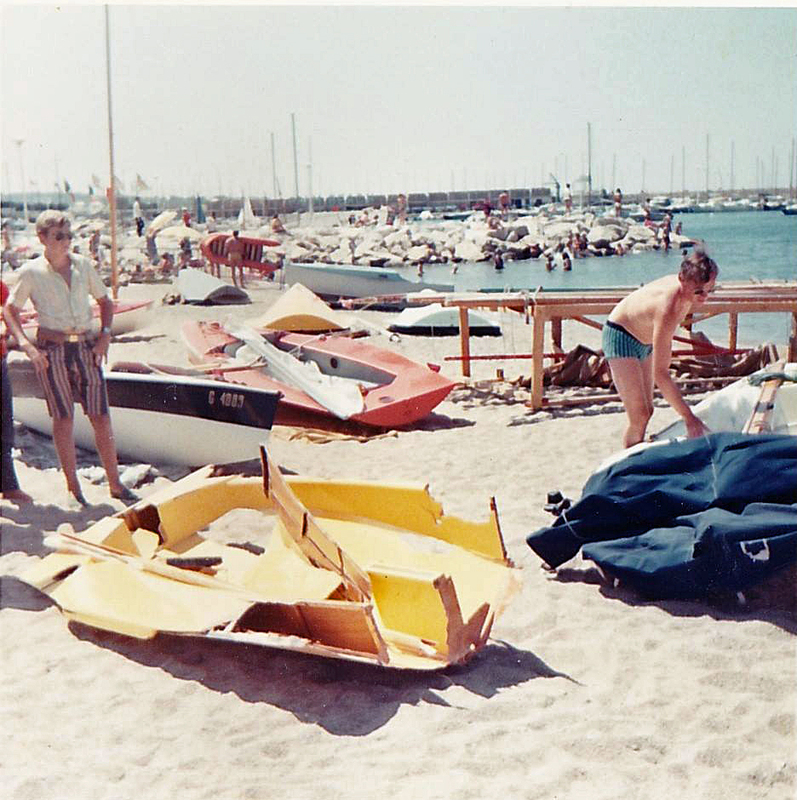 The wind was screaming through the rigging as the boats were being readied on the beach. The lighter helmsmen were soon in trouble as the boats sailed out of the harbour and hit the full face of the wind. 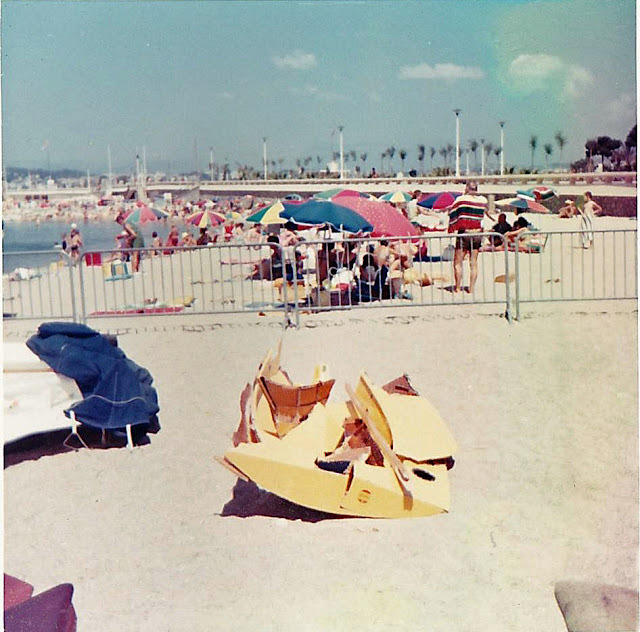 One of the first out, Jean Paul Ladermann (Swiss), in a brand-new, bright yellow Duflos, got caught in irons tacking to avoid a motorboat, and, before he could bear off, was hurled against the vast concrete boulders of the breakwater by mountainous waves. 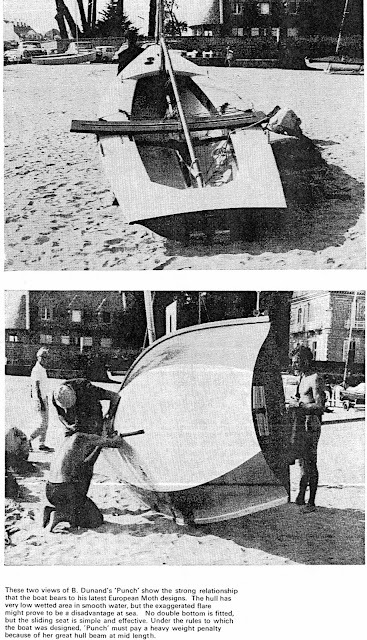 He managed to escape injury by scrambling up the rocks, but within seconds his brand new boat (uninsured) was broken into a hundred pieces. Our heart went out to him, and it certainly did nothing for the morale of the rest of the fleet as they tore out of the harbour past this grim witness of the power of the elements. Marie-Claude was also overpowered at the harbour entrance, but righted again and battled out to the start. 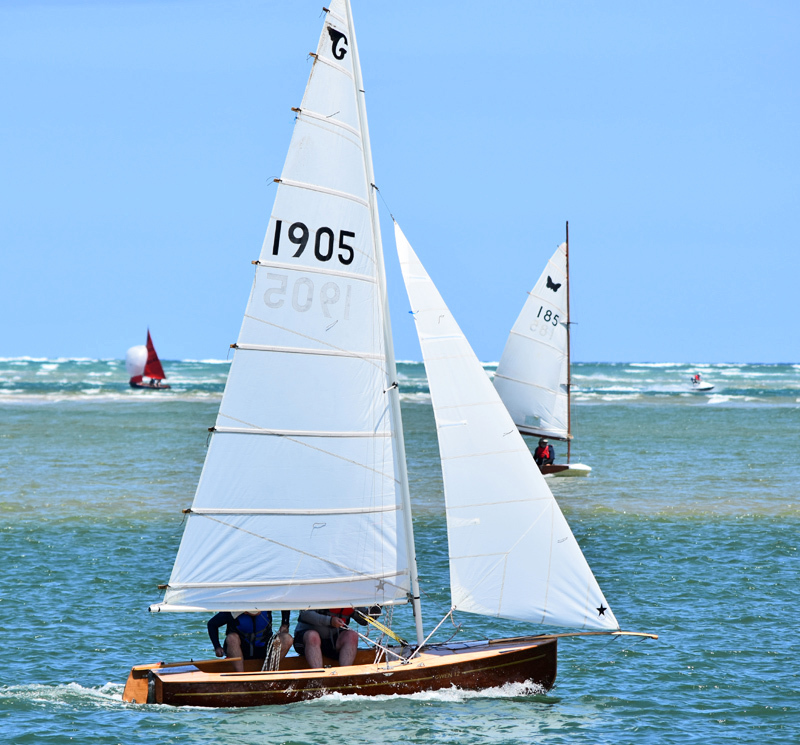 After lengthy delays, to allow the battered fleet to get to the start line, the wind steadily increased from 20 to 30 knots and it rapidly became a battle for survival. Eventually only 24 out of the 47 entrants reached the start line in a fit state to continue." Eleven would finish this race. Photos of some of the survivors returning past the infamous breakwater. Australian Graeme Lillingston won the race. 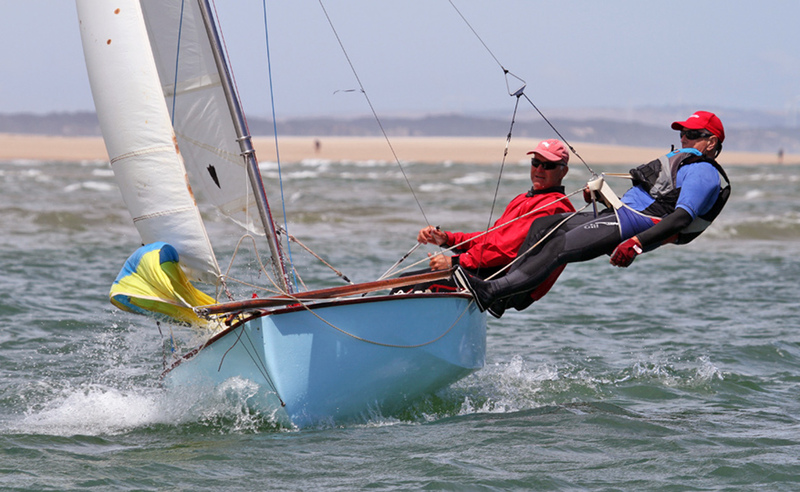 Graeme was using the higher aspect Aussie rig on a scow hull. "I remember it well. 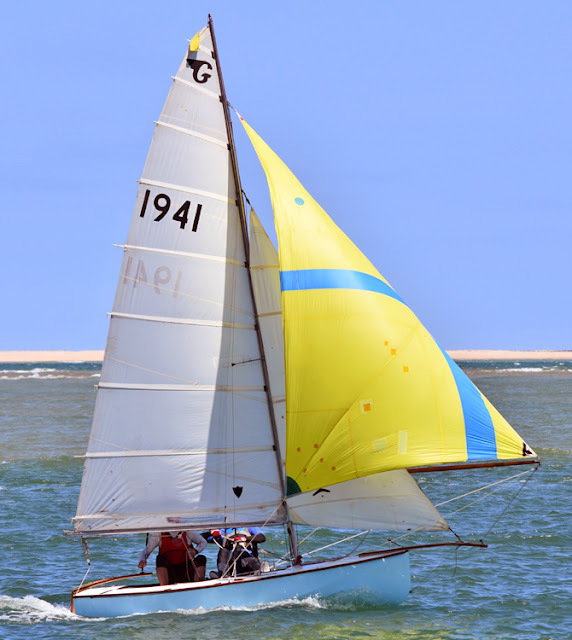 I sailed my Patterson Shelley 2720. No air tanks. Two Elvstrom bailers worked overtime to keep me floating but one kept closing as I would come to the top of a huge swell and the chop would hit the bottom hard. I had to kick it open. During one kick the handle came off and the chute was gone, leaving a rectangular hole [in the bailer]. I was reaching so I rode a wave all the way into a sandy beach. I scavenged an abandoned Moth hull for a replacement and got back in the race. Finished 10th." 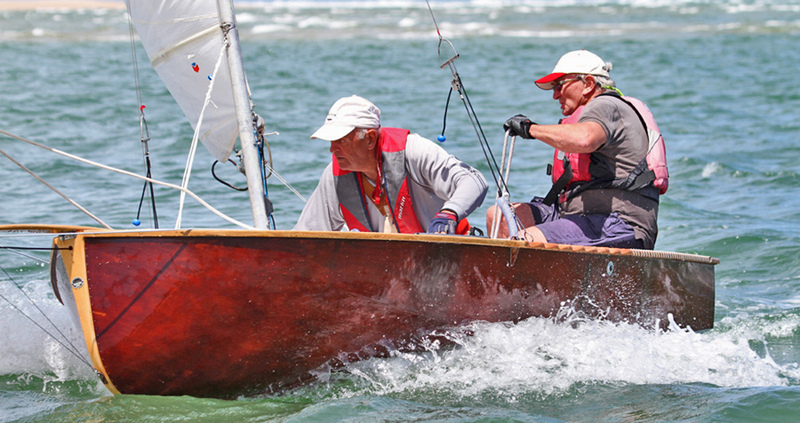 The elder-Mothist, Bob Patterson, with his restored Shelley (built by his father, Carl) at the 2015 Brigantine regatta. 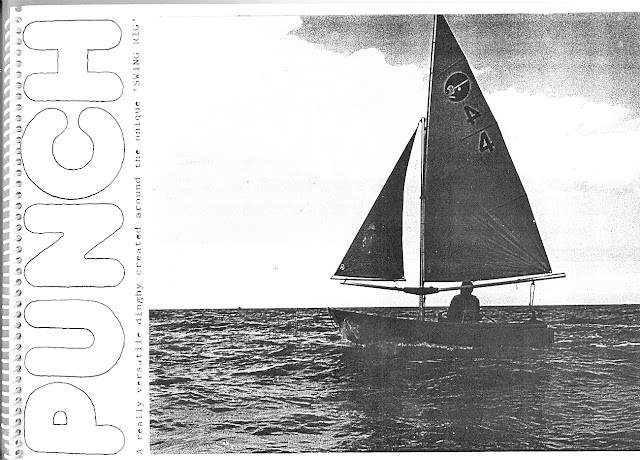 Writing of the Dunand/Fragniére design Punch singlehander for the 1960's IYRU trials reminds me of the other Punch dinghy I have in my files; the completely different 3.3 meter Punch dink designed by Brit Roger Stollery in the mid 1980's. 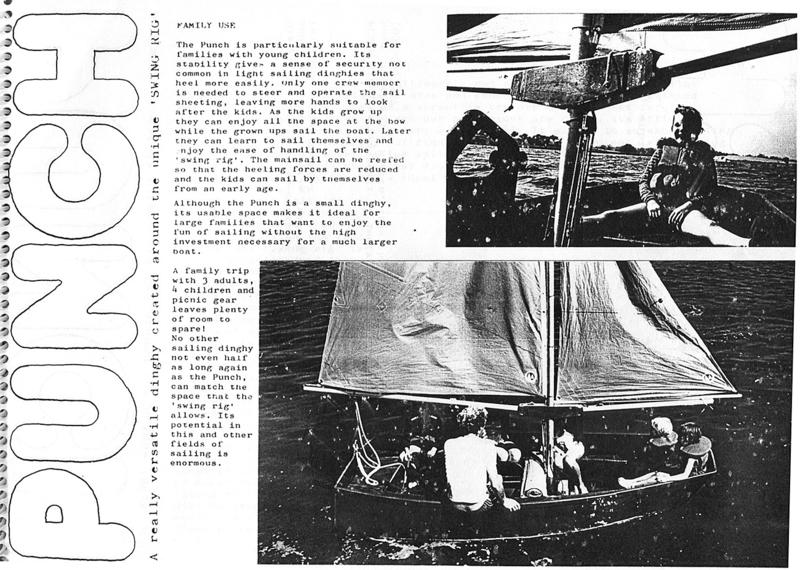 Roger Stollery has been a mainstay in model yachting design for many years and is probably best known for his refinement and proselytizing of the swing rig. To put it simply, the swing rig consists of a 'super' boom that carries both the main and jib; allowing the jib to be automatically trimmed and also automatically rotated out downwind. The irrepressible Dylan Winter caught up with a Punch dinghy on his sojourn around the waterways of England. Let's roll with his always witty videotape. The Punch dinghy is a simple dink for simple tasks. That's all you need to know. 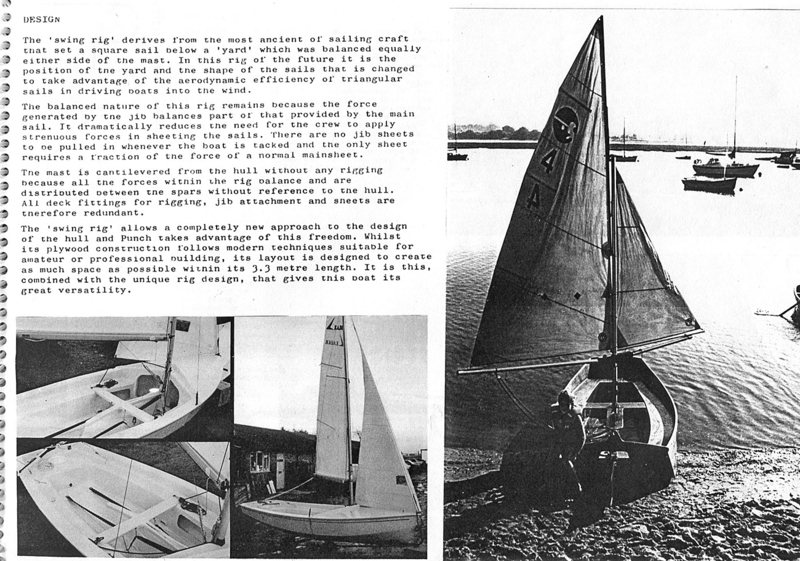 "The Best Presented Sailing Dinghy was won by Rod Mackintosh’s Gwen 12 ‘Grasshopper’ sail number 2846. 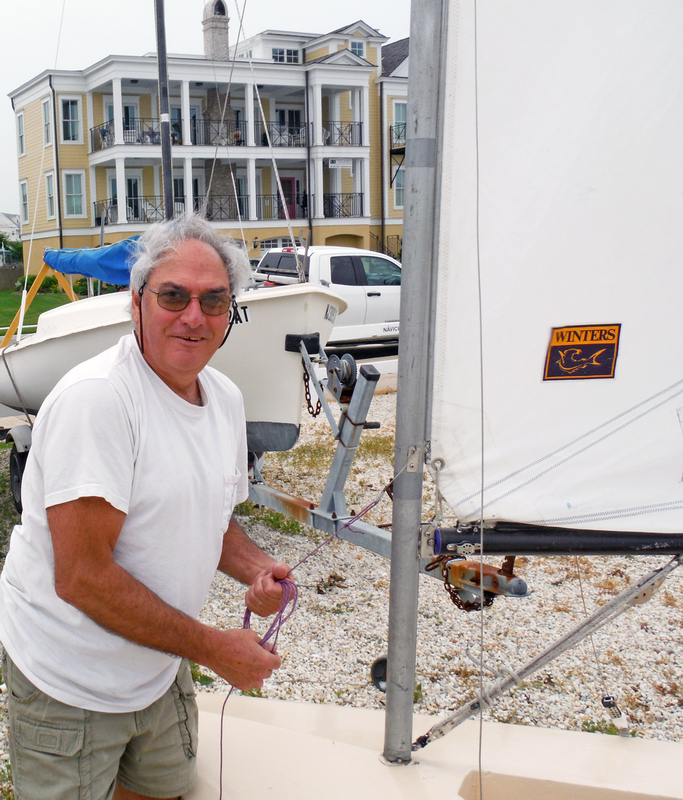 Rod... traveled from South Australia to sail with the other Gwen's. When he acquired the boat it was covered in thick green paint and since then it has been completely restored with clear finishes all over. The Inverloch and District Lions Club Perpetual for the Best Overall boat at the regatta, which is selected from the category winners, was [also] given to Rod Mackintosh’s Gwen 12 ‘Grasshopper’." "As the Aussie's would say " Strewth cobber, ... here is a header photo of two "old Galahs" in a Gwen 12 thinking they were 30 years younger as they get set for a downwind blast. Of course 30 yr's ago they would have been lean and tanned, wearing a footy jersey and shorts, with bare feet, and after blasting around the bay, would have returned to the beach where they would have had two Shiela's in minimal bikinis equally tanned lying on beach towels waiting for their blokes with cold beers ready and waiting in the "esky" for the boys to "scull down" while they derigged and contemplated the evenings activities with the Sheila's, knowing that they were "good sorts" who liked a drink or two and with the usual approach of Aussie girls in that era " if you want a "root" to round out the nights entertainment "just ask !! I kid you not, I lived there for four years and I remember well; " with more than a smile or two." More photos. No. 1905 is Wayne Fry's Scud IV. 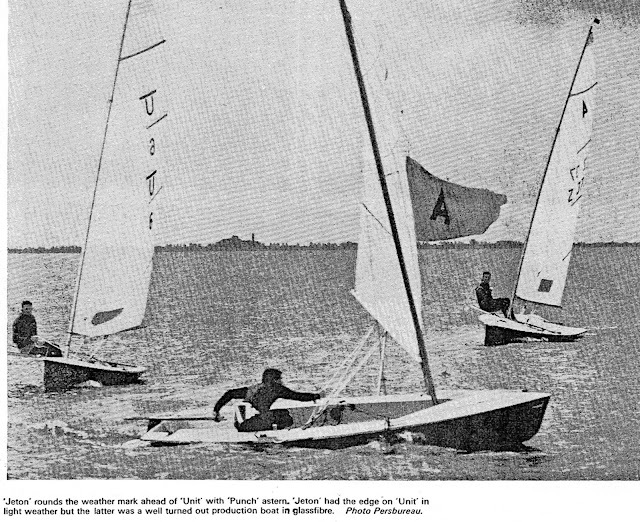 Toby Leppin and Geoff Rippingale upwind. Back in my International 14 days, when we saw such a relaxing photo, especially with the spinnaker being ready to be deployed, we said the crew was pausing to make the skipper a cup of tea. 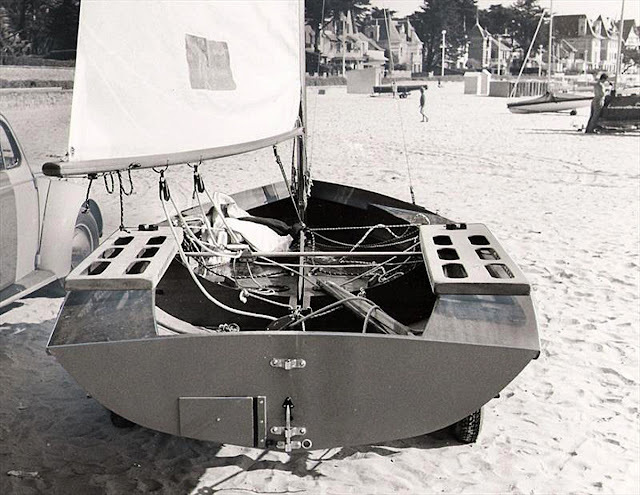 I've commented before in Earwigoagin about the seeming complete die-off of the single trapeze performance dinghy - a puzzlement to this old fellow who remembers large fleets of Fireballs and 470's and Flying Dutchman in North America. (The 505 soldiers on but at an almost professional level.) I can't think of a better plywood project for a single trapeze, spinnaker dinghy than the Gwen 12. ICWDR 2017 SEGMENT5 from drift media on Vimeo. Apologies, but Andrew sent me photo attributions for these Gwen pics but I've mixed the photos up to the point I'll have to wait for Andrew to set me straight. I've usually done a music video for Valentines Day - a day late this time. For the dark side of love, another bittersweet, lost love song; "I had all and then most of you, Some and now none of you"
If you want a more upbeat love video I refer you back to Earwigoagin's archives. Although I can't see the sail logo in this photo, I'm confident the previous header photo is of the woodie Dutch class, the grote BM 16m2. This is the second time I've done a header photo post on this class. You can read the first post on the 16m2, a post which has more background history. The 16m2 also features in a post I did on an unique method of recovering the 16m2 from the water to dry land.